Why Pick Us for your Laser Hair Removal? We are one of the best Laser Hair Removal Spas in South Florida with over 5 years of experience, so you can expect excellent results. Our detail oriented laser technicians are well trained and passionate about helping you to get flawless and hairless skin. At Natural Beauty Laser in Boca Raton, we use only the most advanced lasers and technology and have multiple lasers to treat all skin types. In our office, you can feel secure knowing that you are getting the safest, most state-of-the-art treatment, with the best possible results. We use the State-of-the-art Candela GentleYAG and Cutera XEO, both FDA Approved lasers for permanent hair reduction and other cosmetic procedures. Both manufactures some of the best, most advanced lasers for cosmetic procedures in the industry. Treatment of Wrinkles and Redness, Management of Large Pores and Skin Texture. Laser Genesis skin treatment is an innovative, technologically advanced way to promote vibrant and healthy looking skin in men and women. Now patient can have a youthful appearance by treating those conditions that are typically associated with premature signs of aging and sun damage, such as excessive redness, large pores, uneven texture, and fine-line wrinkles. The Laser Genesis procedure has been scientifically proven to produce new collagen. At Natural Beauty Laser we uses Syneron Candela lasers for hair removal. They are the most gentle lasers available for hair removal. People are often amazed how little it’s hurt compared to their previous experiences with lasers and waxing. you will experience a sensation often described as a “hot pinch” or “snapping” feeling. The sensation only lasts for a fraction of a second, and you may feel warmth or a tingling sensation for a short time afterward. For your convenience, we offer numbing creams and post laser topicals to reduce any possible irritation. To remove the hair, you will most likely need at least 6 treatments. that’s because hair grows in cycles, and only the follicles that are in an active growth stage, at the time of the treatment, are eliminated. When the next stage of hair becomes active (about 4-8 weeks later), you will come on back into for the next treatment to zap those hair while they are in their active growth stage. 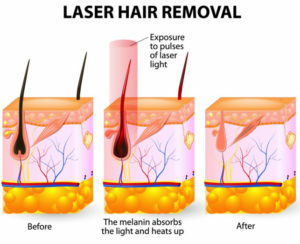 What can I expect from each laser hair removal treatment? Each laser hair removal treatment will result in a hair growth reduction. Additionally, hair will grow progressively slower, lighter, and finer with each treatment. It takes more than one treatment to affect all the follicles growing in an area. Most people achieve satisfactory clearance after six treatments, but individual results may vary depending on medical and genetic factors. Lighter colored hair may require more treatments than darker colored hair. At the end of your protocol, the desired outcome is 90% to 100% clearance in the treated area.